The conventional wisdom has always been that a calorie is a calorie is a calorie, and as long as you are expending more than you are taking in, you’ll lose weight. But many people who have struggled with weight loss have long felt that there was something wrong with that point of view. New medical research suggests that they are right. For many years, dieticians thought that it did not matter what sort of food a calorie came from. But it turns out that your body handles different sources of nutrition differently, and different bodies will metabolize foods in different ways. While many people have considered low fat diets more healthy, many naturally high-fat foods can, in fact, be part of a healthy diet. The fats in foods like avocados, nuts, and fatty fish like salmon can promote weight loss, prevent heart disease, and reduce the risk of diabetes. Because these foods are calorie dense, you still want to consume them in moderation. But they are filling and can keep you from mindless snacking in between meals. Highly refined carbohydrates (such as those in white flour, sweetened cereals, and sugary drinks) on the other hand, can make losing weight more difficult. These sugars raise the level of insulin in your blood. This, in turn, can signal your body to store fat cells. These foods also pass through your digestive system quickly. This can leave you feeling hungry just an hour after eating an entire bag of potato chips and can contribute to overeating. The problem with counting calories, experts say, is that the processes involved in breaking down food and deciding if it should be used for energy or stored as fat are so complex that simply restricting calories does not work. It is better to limit the types of calories that are most likely to become fat such as those from refined carbohydrates. In the end, the best approach is to avoid counting calories and focus more on a healthy diet. 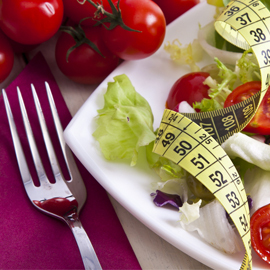 By eating a varied diet rich in whole foods, you can make yourself healthier and lose weight.